Some of my friends say like this: “Good-quality cameras never come cheap!” – Hhmm, I do not think the same, so I write this review on best trail camera under $50 to show dozens of affordable choices which cover fantastic features still suited for hunters’ needs, and for YOU. 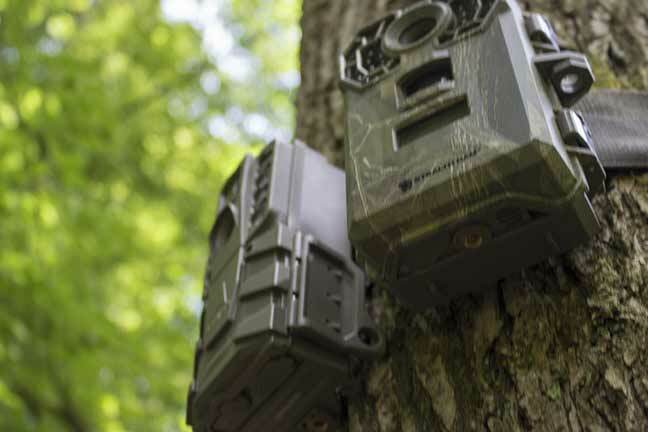 The today list includes top 7 cheap trail cameras personally picked from Amazon. Megapixel: Naturally the higher megapixels are, the better resolution photos becomes. If you do not want to zoom and see the very detail of the photos, 8MP and above is enough. Battery life: A trail camera under $50 often supports 4-8 AA batteries which can take thousands of pictures. In case you place the camera somewhere with lots of activities, you will need more power batteries. Trigger speed: That of affordable game cameras is often between between 0.8s and 1.5s seconds. Faster triggering time is in need if you want to capture fast moving objects. When you plan to shoot deer or check home security, the trigger speed is rather less important. Photo settings: Low-priced cameras often go along with basic modes such as photos, videos, or hybrid. Things like wi-fi connection, burst mode, time-lapse are usually missing. Detection ranges: So far, I have noticed that trail camera under $50 often covers the capturing range as large as 60-65ft. If want further, you must pay more. In case you are in a hurry; fortunately, I have a snapshot of specifications here for your references. If not, you should digest each of the following review pieces to make the most informed decision on your best-suited trail game under $50. Generally, I will capture what I like the most about the camera, its key features, and its pros & cons. Personally, I adore capturing the images of wildlife as vividly and as from different angles as possible. Thus, I have a preference for game cameras with high resolution and low glow infrared LEDs. The first on the list of best trail camera under $50 provided by Touguard fits my needs well. Safe to say this is among the best choices when you look for cheap trail cameras with fancy features. I have already used two Toguard cameras, one for my hunting spot and the other for home security. All work well. Thanks to 14MP and 1080P resolution, 0.5s trigger speed, and wide detection extent (42-pc LEDs & 120° Angle Lens), the quality of both photos and videos is excellent, even during the night hours. I give one more thumb up for the camera’s clear audio recordings. Though this Toguard camera is unexpectedly feature-rich at less than 50 dollars, there are some points I wish to improve more. First, the features work almost as promised but the instruction is too complicated. If you are new with a trail camera, it will quickly turn you to annoyance. Second, I expect the exposure time to be possibly adjusted by users so that I can set up the time faster in some cases. Another issue is the tiny MicroSD card. It is tough to remove or put it in the camera, especially with cold fingers. I once lost the card with many valuable images and videos. What a pity! Despite all the above, I still find this a nice touch cheap trail camera. The next trail camera under $50 for your mind is Campark HD Waterproof Wildlife Deer Hunting Cams or Campark T30, for short. The thing I really like about this game camera is its 120 degrees 3 PIR sensor. Not only does this feature provides wider detection angle and faster trigger speed but it also helps lower the usage of battery while working. Great! Honestly, I did not expect such good-quality photos since the resolution is the only 8MP – a little lower than other trail cameras on the list. Then, it turns out both day and night shots are extremely well due to fast triggering speed, high sensor design, and low-glow IR LEDs. Moreover, Campark T30 is waterproof – I’ve tested, and it does work well anywhere outdoors and through any weather. Battery life is really good. You can even save more power with wise configurations. Believe me; it is a breeze to set up with a user-friendly navigation menu. Now discussing a few things I do not like about Campark T30. Here again, the usage of a micro SD card instead of the standard makes it super hard to handle sometimes. And, remember to use the standard class 10 card or over since the slow-speed card might affect the camera’s functions. In addition, the batteries and SD card are not included in the package, so you have to pay some extra, but just a little bit more. Generally, this trail camera is a steal for the price under 50 dollars. You can buy one or two packages as a sweet gift for your boyfriend or father. Coming at the similar price of the Toguard and the Campark, Trail Camera 12MP PH730S by ENKEEO is another worth for your consideration. From the very first, I was impressed by how vibrant the features were at such a cheap price point. Besides the high resolution, fast trigger speed, and wide capturing range, I like the fact that I can view photos right on the camera’s 2.4” LCD screen. It means I no need to take off the SD card quite often to check the result. Usually, you can find this feature on much more expensive game cameras. As can be seen from the feature snapshot, both image and video resolution is high. Hence, you can expect clear and crisp images and videos with great sound. The lighting trigger time (0.2 to 0.6s) and sensitive 120-degree angle PIR sensors ensure that all tiny moments of animals up to 65ft will be captured vividly and in real time. Time-lapse function and LCD add values to this cheap package that bring convenience for your image and video management. Also, battery life seems forever. On the downside, I do not appreciate its lightweight design that makes me feel like it can be easily broken if dropped. Though the feature says that the camera is equipped with an IP54 waterproof case, it turned out not thoroughly water resistant. I have bought three PH730S cameras, two of which are used indoors and the other is hung outsides. The two first work exceptionally well. Yet, the one on the tree got washed and water leaked into the battery, making it stop working. Hence, I strongly recommend this cheap trail camera, but better for indoor use. I got a sight of this device, for the first time, when I sorted Amazon Game & Trail camera – It is marked as one of the best sellers. Now that I have already had it in hands, I know this trail camera is worth for good reasons. First is its neat size, making it easy to set up and hook on trees. Second is its great-quality images both in light or darkness, better in the daytime I might add. As said, the quality of pictures taken by Wildgame Innovations TX10i1 is very clear, especially in the daytime. Not to mention, I haven’t come across any whiteouts since the LEDs are red at night so far. I presume that the whiteout picture only happens if something gets very close to the camera. Plus, the design is light, and all configurations are easy to set up. The battery life is pretty good as well. What I do not like about this trail camera is its impossibility to adjust the time between pictures. I mean you might get hundreds of trash pictures which cost your time to remove and also battery power. On the other hand, neither SD card nor battery is included, so you have to pay some extra. Anyway, speaking of image quality, this trail camera under $50 is still a pocket-friendly price tag. Personally, I like this trail camera the most when it comes to trail camera under $50 since it covers almost all outstanding features mentioned in the article. A lot of values packed into a surprisingly cheap package. I am especially impressed by the vivid and colorful shots in the daytime thanks to the excellent 14MP photo resolution. Features are rich and compact; I checked all. This cheap trail camera has an excellent resolution of images and videos to shoot high-quality pictures and videos both in the daytime and at night. Not to mention, the wide angle lens and fast PIR sensors give the ability to capture almost all motions at a broad range. The settings are user-friendly. Just turn it on, and you can play around with all options in several easy steps. Nothing much to complain but if there is a thing I like the least about this trail camera is its small design and its Mirco SD support. It becomes hard to insert or take out the card from the camera bottom, especially when it is mounted and even worse in cold weather with a glove. Back then, I rarely bought a camera using Micro card. However, now that I already used several cheap trail camera under $50, most of which support the Micro, I know how to handle it better. I do not want to miss wonderful features at an attractive price. The next name in the list of best trail camera under $50 is TEC.BEAN camera 12MP 1080P. The signature feature catching my eyes toward this device is its already-built-in coding to keep the camera safe from theft. Accordingly, there is a password to díable the screen display from others. Gods know I have already been stolen several ones hung outsides, some of which cost hundreds of dollars. Other features are quite similar to others here. Even though the trigger speed seems slower than several other trail cameras under $50, the quality of photos and videos is outstanding due to high resolution and sensitive IR LEDs. I like the fact that this game camera supports different modes such as replay, motion freeze, time lapse, hybrid, motion detection, etc. Besides, the password protection, LCD, and waterproof make the camera more worthy to purchase. First to complain: instead of ideal no-glow black LEDs as described, the LEDs are somewhat red at night. Hence, TEC.BEAN camera 12MP is LOW-glow actually. Another drawback is that the battery is quickly eaten up in a few days. Moreover, the old files are automatically removed to make room for new ones. That time, you must pay more for a regular battery change and the new SD card. Here I introduce the last on the today list, but definitely not the poorest in features. Know what I surprise the most about the Victure Trail Game Camera HC200? – That is its rich built-in features at a very very affordable price. As you see, I often get troubles with the Micro SD so I am happy that this trail camera supports the regular SD card as well. Such a plus, to me! Like other trail cameras under $50 with similar resolution and features, the pictures and videos captured by Victure Trail Camera are good in quality. The fast trigger speed makes it easy to shoot any motion coming through the path. Also, the over-2-inch screen allows previewing the result without taking out the SD card. What convenience! The waterproof IP66 case protects the camera even in a harsh environment and ensures all functions work well. So far so good. The only thing to consider is that the camouflage color is great to be hidden from animals and thieves, yet it might not fit your wall color. Obviously, high-end cameras often include a package of fantastic features such as wireless network, high resolution and sharpness, fast motion detectors and focusing abilities, high pixels, etc. However, if you have a tight budget for several cameras or you just want some standard features, it is no need to break a bank for top-end cameras. Above I have given some thoughts on my best-recommended trail camera under $50. Hope you guy can make an informed and wise decision. P/S: Find this review on cheap game cameras helpful? – Do not hesitate to share it with others.